This astonishing landscape of cave-houses lies just 40 minutes from one of Andalucia’s most sophisticated cities, Granada. so if that’s where you are, consider a short day-trip. 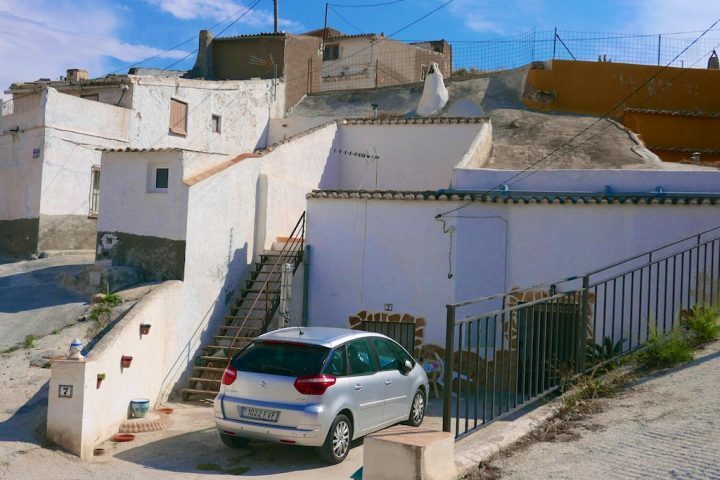 I’m talking about Guadix, where cave-dwelling continues apace and gentrification is turning some cuevas into mini mansions. From afar, whitewashed chimneys popping out of the rock are the clue. The surrounding landscape of furrowed sandstone and clay formations is spectacular, very Far West and in fact Indiana Jones was filmed here along with dozens of lesser known movies, now lost to oblivion. 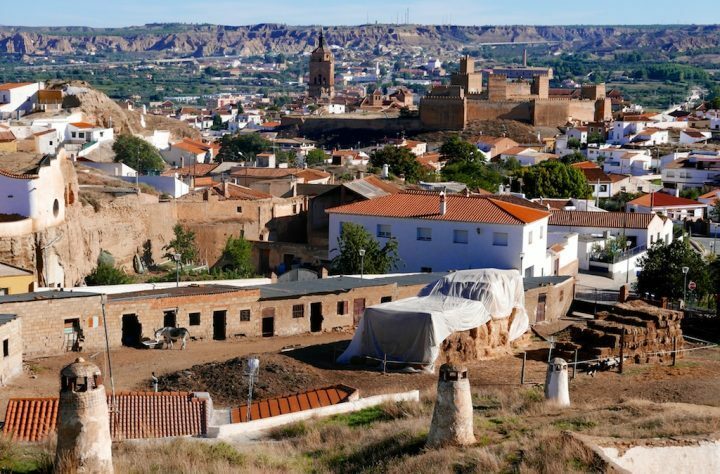 Although the entire population of this country town numbers barely 20,000, Guadix proudly claims to be the European capital of cave culture. Nowhere else has such an extensive network, winding through craggy outcrops deep into the hills. This Barrio de las Cuevas (Cave district) is where about 4,000 people inhabit some 2000 cave-houses (the figures change depending on who you’re talking to). They even have their own church dedicated to La Virgen de las Cuevas (Virgin of the Caves). 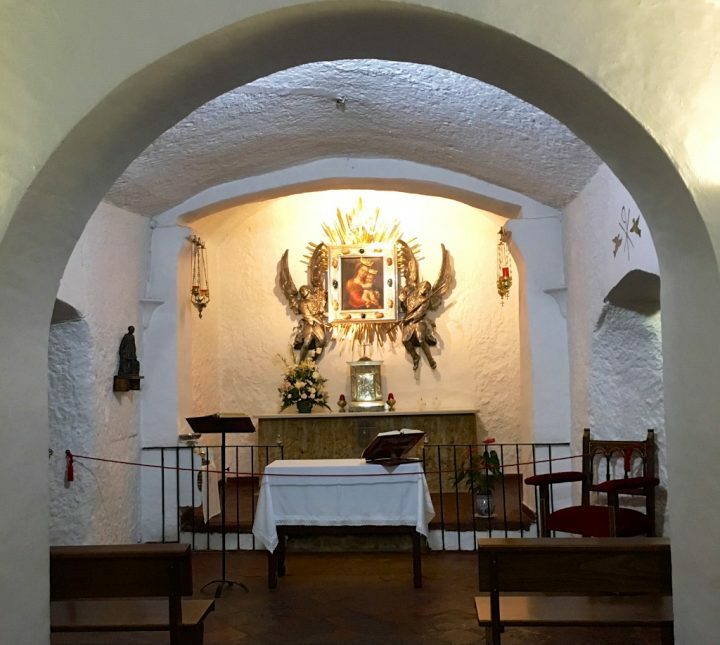 Originally a modest hermitage, it was completely rebuilt in 1962, but if you explore the back of the church you find a succession of whitewashed passages and caves leading to the original shrine, where a late 17th c painting of the troglodyte Virgin surveys all. One fallacy is that this is a ‘gypsy’ quarter. Wrong. It’s thought that the first inhabitants came here after Granada, the last bastion of Moorish Spain, fell to the Castillians in 1492. 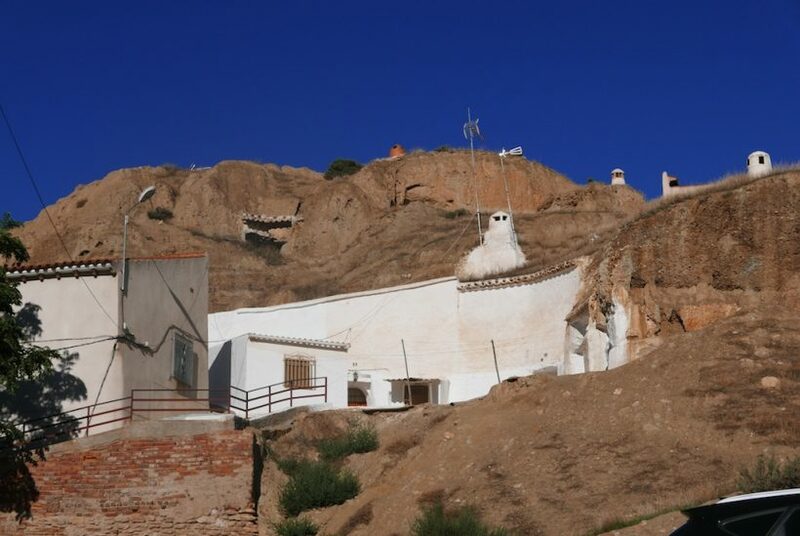 As moriscos (Muslims forcibly converted to Catholicism) became persecuted, then rebelled in 1568, many fled from Granada and the Alpujarra mountains to this Guadix cave area. Their predicament worsened in 1609-14 when the moriscos were ordered to definitively leave Spain. 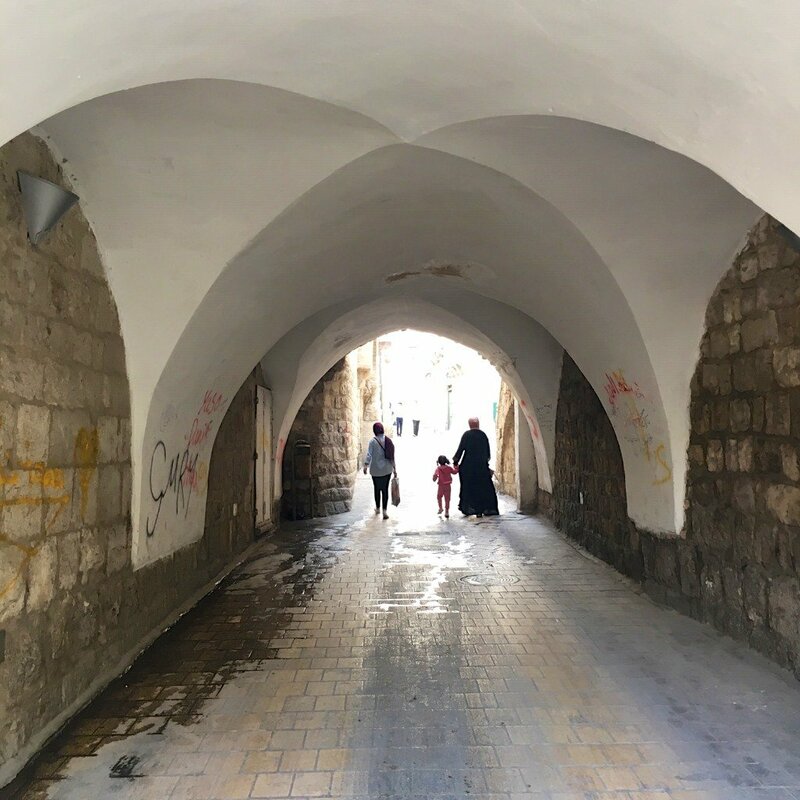 Those who were desperate to remain or couldn’t afford to leave, took refuge in caves – and stayed. And there you have it. To one side of the church, steps lead up to a mirador (look out) – not to be missed. On the way up you will undoubtedly meet José, a gnarled, middle-aged gentleman who hovers outside his cave-house, serves cold drinks & waves you inside. “No cost!” he mutters genially, though there’s a large basket for propinas (tips). It’s only a two-bedroom version but is nicely kitted out, with a large dining-living area for family gatherings. 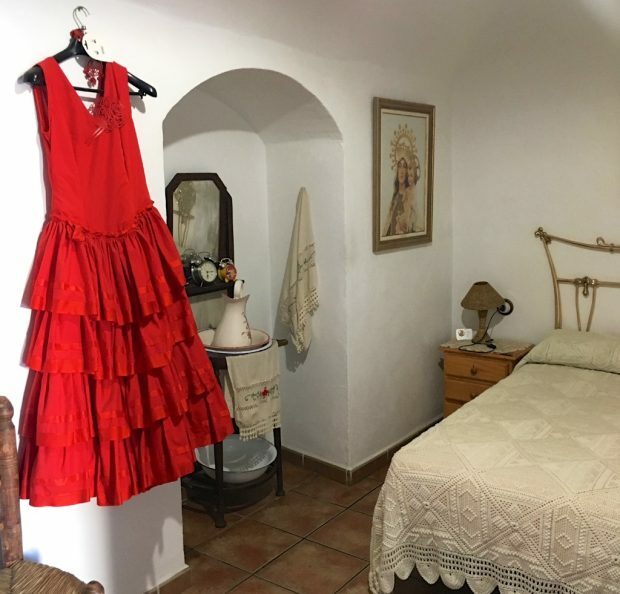 I particularly liked the splash of a red flamenco dress, pictures of the Saint and a vintage 1970s TV – all adding to the sense of a personalised time capsule. 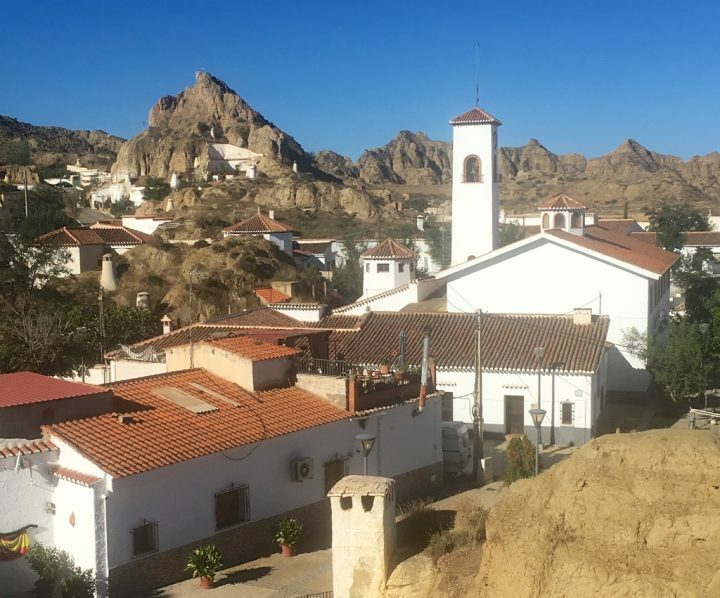 Up on the terrace, sweeping views take in the pockmarked landscape, while looking back at Guadix (over a farmyard complete with donkeys and hay-bales) you see the heavily restored 11th c alcazaba (fortress) bristling with crenellations, and the cathedral, a massive 16th-18th c hulk, part Renaissance, part baroque. Behind unfold the corrugated ridges and gullies of the ‘badlands’. In the last 20 years or so, cave-houses have become rather desirable investments, although when I slept in one of the pioneering cave-hotels back in the 1990s, I found it distinctly claustrophobic. In my hobbit-like room, nothing moved, not a breath of air, not a sound, nada – and no natural light. This total stillness and silence may be relaxing for some but I yearned for bird chatter, the whisper of a breeze and the glimmer of dawn. 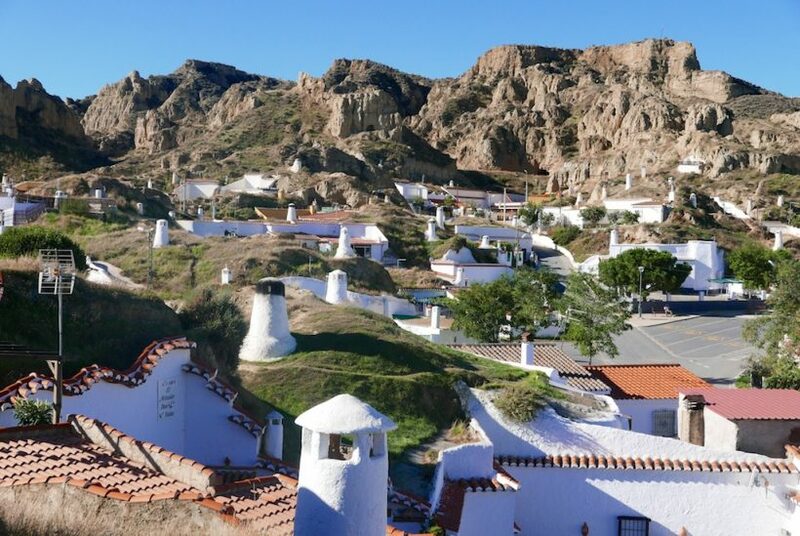 Today Guadix has a plethora of cave-hotels – search and you will find! Nonetheless there are plenty of advantages, one being how easy it is to enlarge your home (just dig further into the rock or build out in front), the other being the constant temperature throughout the year, meaning you don’t need air-con or heating. That leaves the cave-dwellers with extra cash for tiled floors, fully fledged kitchens and bathrooms, cars, finials and gates. 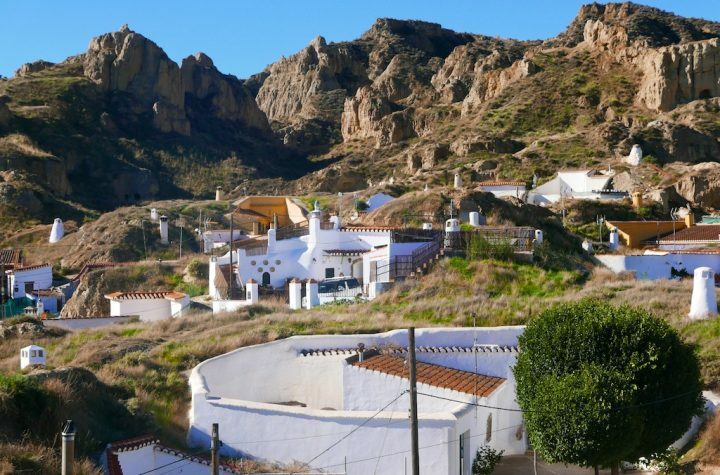 Back in the day, I remember the cave district of Cuevas del Almanzora (in the province of Almeria) peppered with burglar alarms and TV aerials. There were no visible alarms here – maybe that Cave Virgin is a reliable protector. 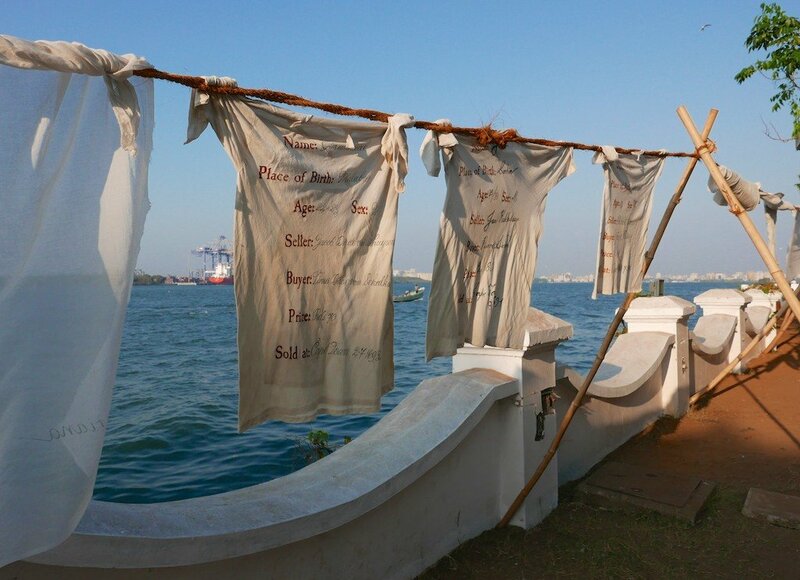 So where else in the world can you see such a way of life? Coober Pedy, in the sweltering desert of South Australia, has a huge underground network, now mainly hotels and lacking the quaintness and age of Guadix. In Turkey’s magnificent Cappadocia, most of the cave-houses are now swish hotels and restaurants (I slept in one years ago – when snow blanketed the surreal landscape outside & it stayed toasty inside). In southern Tunisia, Matmata’s cratered landscape is riddled with Berber cave-houses, mostly abandoned when 1960-1970s policies forced their inhabitants to move to new towns. I remember once sipping tea there in a derelict, hilltop cave with a Berber farmer who, every day, trudged up from his modern apartment below to make tea in his former home. 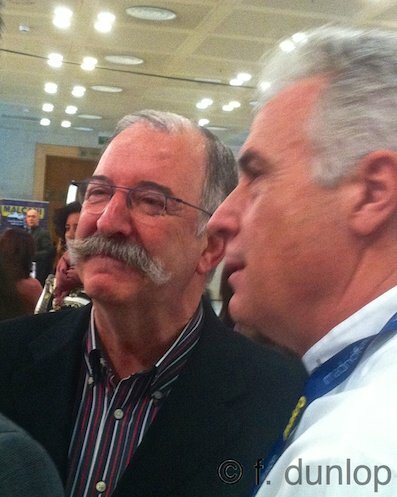 Old habits die hard. However it’s northern China (the Pingyao area in Shanxi province) that, predictably, has the most impressive tradition of cave-dwelling of all, a habit that goes back 5,000 years: three million people (yes!) are said to still live in them. On my list.